When you think about venturing out the gates or deep into the mountains to ride, you know that at a minimum you need a beacon, shovel, probe, partner, and of course your avalanche training. 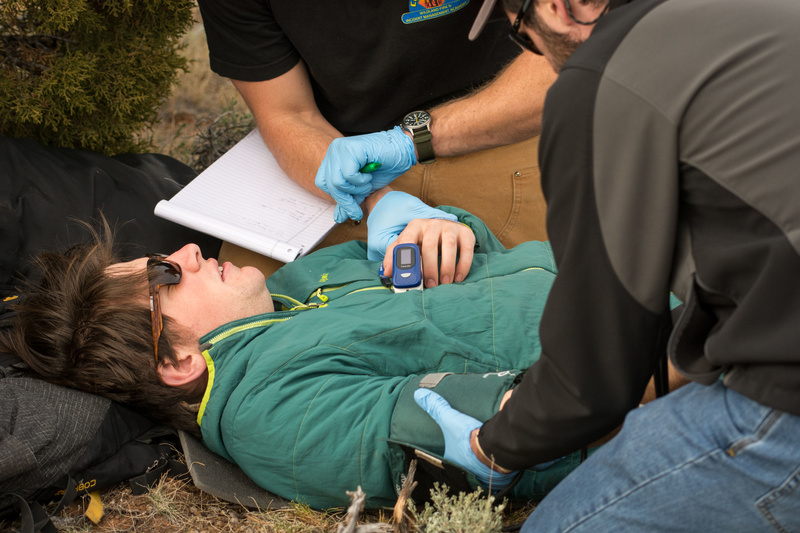 Just as important, but often overlooked is some basic to advanced wilderness medical training. I get it, it’s one more thing to spend money on and hopefully, you’ve never been in a situation where you’ve had to use any medical skills. But things happen and if medical care is not easily accessible, an uncomfortable situation can easily turn into a life-threatening one. As much as we strive to come home safely every day, statistically things are bound to go wrong eventually. Someone hits a tree, catches a buried branch or rock, or takes a fall. Suddenly you’re dealing with an injury in a setting that’s not ideal. It could be blowing snow sideways or below 10 degrees while your partner is struggling in pain. How prepared are you to deal with this situation? At the very least, wilderness first aid gives you the foundation to assess your patient, treat what you can, or keep them in a stable state until help arrives. Currently, we’re conditioned to think that help is always just a phone call away. In some cases, it is, but in many backcountry situations, the complexity of the terrain, your location, or even the weather could delay search and rescue. Once again, having the tools and knowledge to assess, monitor, and stabilize a patient in these types of environments is crucial. Hypothermia is a real threat in the winter while waiting for help to arrive if your buddy is immobile. When you’re venturing into backcountry terrain, typically you trust your partner’s skills to be able to locate you and dig you out if an avalanche occurs. The same should be said for taking care of you if you break a femur. Hands down, if I know my partner has wilderness medical training, I’m more likely to tackle larger objectives with them. 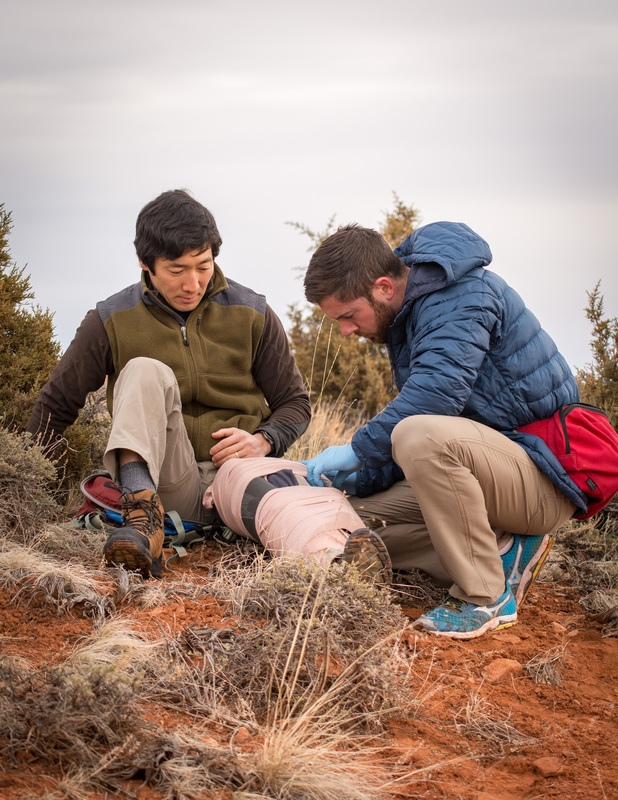 One of the easiest ways you can be a better backcountry partner or team member is by having a Wilderness First Aid or First Responder training. Being trained and having a trained partner means having confidence in one another to know what to do if things go bad. It also means you’ve both thought about what additional supplies you are packing in the case of an emergency, which creates opportunities for more effective treatment plans. Which brings me to my next point. Do you travel with a first aid kit in your pack? If yes, could you tell me what’s in it? What about an emergency blanket? Extra snacks or hand warmers? One of the biggest takeaways from medical training is how unprepared many of us are to deal with an injury. I mean gauze is great for a deep cut, but it’s not going to help you splint a knee. A wilderness first aid course gives you a great baseline for additional supplies you should be carrying and even helps you better select what you need to carry based on your trip plan. For example, if you have a six-hour approach, maybe you want to bring an emergency blanket or bivy with some extra hand warmers in case there’s an injury and you’re sitting in the snow. 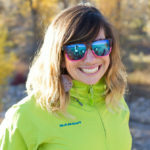 You would pack differently for a sidecountry day then you would for a major mission and the same goes for injury management. Wilderness medicine helps you be more prepared but also allows you to streamline. While every trip is different, here are a couple staples I always carry – a wilderness medical kit (I like the one from Adventure Medical as it’s pretty complete right out of the box) which includes materials for treating cuts, wounds, a mask for CPR, and gloves. I’ll also add a SAM splint since it’s lightweight and an easy piece to utilize for smaller splints, and a few ski straps. For more intermediate days, I’ll make sure I’ve got an emergency blanket packed, extra hand warmers, and an extra high fat snack that never leaves my first aid kit. Think RxBar, ProBar, or something with a higher volume of calories and protein. I would say a Snickers bar but those tend to get eaten. If I’m going on a bigger mission, usually my partners and I will divvy up different things so that we can add a rescue sled, extra pad, or an inflatable Thermarest in addition to an emergency bivvy. The difference being, the longer and further you’re out, the more resources you’ll need to take care of your patient and yourself while you wait for help or figure out an evacuation plan. This is the doozy and I don’t bring it up to get heavy, I bring it up because it’s true. 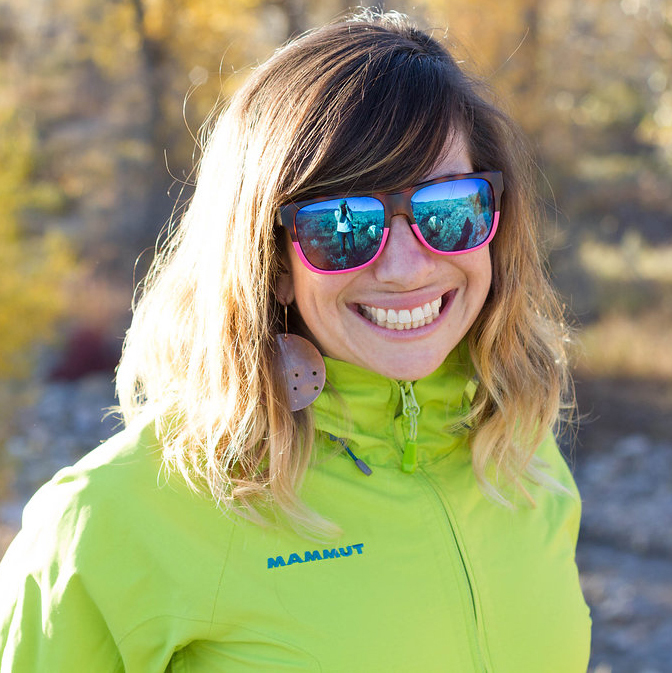 There have been more than a few documented backcountry situations where a minor injury results in the patient’s death due to hypothermia, the inability to keep an injured person stabilized, and misunderstanding injury progressions. If your partner hits a tree and has internal bleeding, knowing how to monitor the symptoms or even being aware of what to look for can give you the tools to correctly treat, communicate, and potentially save their life. How would you feel if your partner was injured and there was nothing you could do to help? Having the toolkit, even on a basic level, gives you the power to better assess, treat, and get your partner rescued. Knowing CPR and rescue breathing if someone was submerged in a tree well could be the difference between life and death. It’s really a no-brainer, if you’re venturing out in the backcountry you should be ready to deal with a medical emergency should it arise. A Wilderness First Aid Course is typically two to two and half days, with classroom time and practice scenarios so you can hone new skills and ask questions while absorbing the material. The next step up would be a Wilderness Advanced First Aid Course, which expands to five days of training and practice. 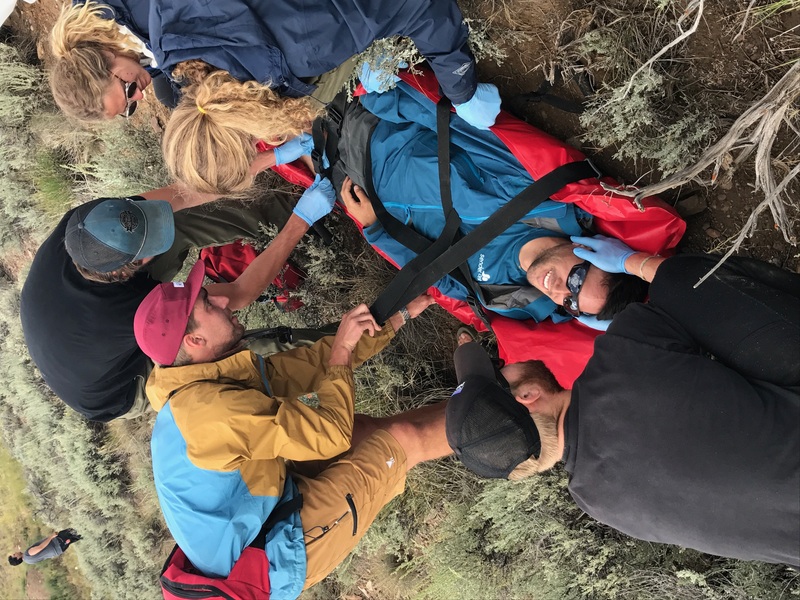 It will include more coverage on long-term wilderness patient care plus expanded medical topics like dislocations, injuries to specific systems (like respiratory injuries and distress, abdominal and cardiac), and includes a written and practical exam. If you’re going out on longer tours and wilderness missions, a Wilderness Advanced First Aid will give you more resources and skills to manage emergencies in these settings. A basic Wilderness First Aid Course is a good first step for smaller day and side country missions. 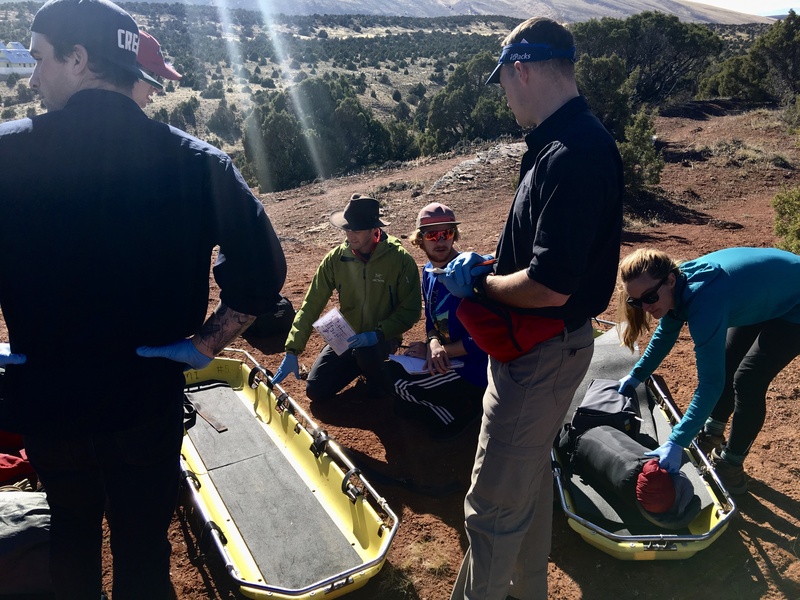 For expeditions or multi-day backcountry trips, it wouldn’t be a bad idea to consider getting your Wilderness First Responder (WFR), a 10-day course which prepares you for a multitude of injuries, situations, evacuations, and patient management scenarios. If you’re ever interested in trip leading or guiding, you’ll need this certification as well as an industry standard. Note that not every basic Wilderness First Aid Course includes a CPR component so plan accordingly. Keep in mind that if you are digging someone out of an avalanche, it is possible that they will need rescue breaths or CPR. Being prepared to travel in backcountry terrain means you’re taking responsibility for not only your own life but also your partner's. With that in mind, it’s important to be prepared for not only avalanche risk but also injury. Even though it’s often overlooked, getting a Wilderness First Aid, Advanced First Aid or First Responder training prior to spending time in the backcountry will make sure you’re on top of your game should an emergency arise. Add it to your arsenal, be a better partner, and go get after it.